ww2dbaseAlexander Löhr was born in Romania, to a German father and a Russian mother. During WW1, he served as a platoon commander in a pioneer battalion of Austro-Hungarian 85th Infantry Regiment. After the split of Austria-Hungary, he remained in the army of Austria, from the rank of lieutenant colonel in 1921 to the commander of the Austrian Air Force in 1938. 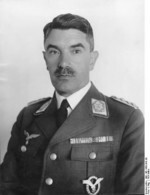 Upon the German annexation of Austria, he retained control of the Austrian Air Force, albeit now a part of the German Luftwaffe; he was given the rank of lieutenant general in the Luftwaffe to serve in this role. Between May 1939 and Jun 1942, he was the commanding officer of Luftflotte 4 (Air Fleet 4), during which time Luftflotte 4 conducted the bombing of Warsaw, Poland in Sep 1939 and Belgrade, Yugoslavia in Apr 1941. Between Jul and Dec 1942, he commanded German 12th Army. On 1 Jan 1943, he was made the Commander-in-Chief of the South East, in which role he oversaw the Dodecanese Campaign. He remained in Southeastern Europe through the end of the war, surrendering to Yugoslavian partisans at Topolsica in the Slovenia region of Yugoslavia on 9 May 1945. He was tried in Yugoslavia starting on 15 May 1945; found guilty for the bombing of civilians of Belgrade, he was executed by firing squad on 26 Feb 1947. 20 May 1885 Alexander Löhr was born in Turnu-Severin, Romania. 12 Apr 1941 Alexander Löhr was mentioned in the Wehrmachtbericht daily radio report. 23 Apr 1941 Alexander Löhr was mentioned in the Wehrmachtbericht daily radio report. 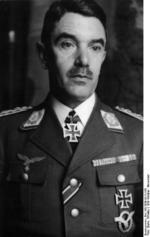 3 May 1941 Alexander Löhr was promoted to the rank of colonel general. 8 Aug 1941 Alexander Löhr was mentioned in the Wehrmachtbericht daily radio report. 11 Oct 1941 Alexander Löhr was mentioned in the Wehrmachtbericht daily radio report. 12 Oct 1941 Alexander Löhr was mentioned in the Wehrmachtbericht daily radio report. 19 May 1942 Alexander Löhr was mentioned in the Wehrmachtbericht daily radio report. 20 May 1942 Alexander Löhr was mentioned in the Wehrmachtbericht daily radio report. 30 May 1942 Alexander Löhr was mentioned in the Wehrmachtbericht daily radio report. 2 Jul 1942 Generaloberst Alexander Löhr was named the commanding officer of the German 12th Army. 1 Jan 1943 Alexander Löhr was made the Commander-in-Chief of the South East, with personal command over Army Group E.
26 Jun 1944 Alexander Löhr was mentioned in the Wehrmachtbericht daily radio report. 19 Jan 1945 Alexander Löhr was mentioned in the Wehrmachtbericht daily radio report. 9 May 1945 Alexander Löhr surrendered to Yugolsavian partisans at Topolsica in the Slovenia region of Yugoslavia. On the same day, he was mentioned in the German Wehrmachtbericht daily radio report. 15 May 1945 Alexander Löhr's war crimes trial in Belgrade, Yugoslavia began. 26 Feb 1947 Alexander Löhr was executed by firing squad in Belgrade, Yugoslavia.